The kids and I have read this Christmas classic several times in the last few weeks. It is one of the four Christmas books that survived the purging process of the last few months. I balked when the kids begged for it to go in the keep pile. I saw it as a distraction from the real story of Christmas. However, this year as we have read it, I have seen it with new eyes. I am not quite sure why it didn’t occur to me before, but the whole point is that Christmas is not about the stuff, including the yummy food-stuff. Perhaps it’s because in the last few years, I have felt a lot like the Grinch concerning Christmas. 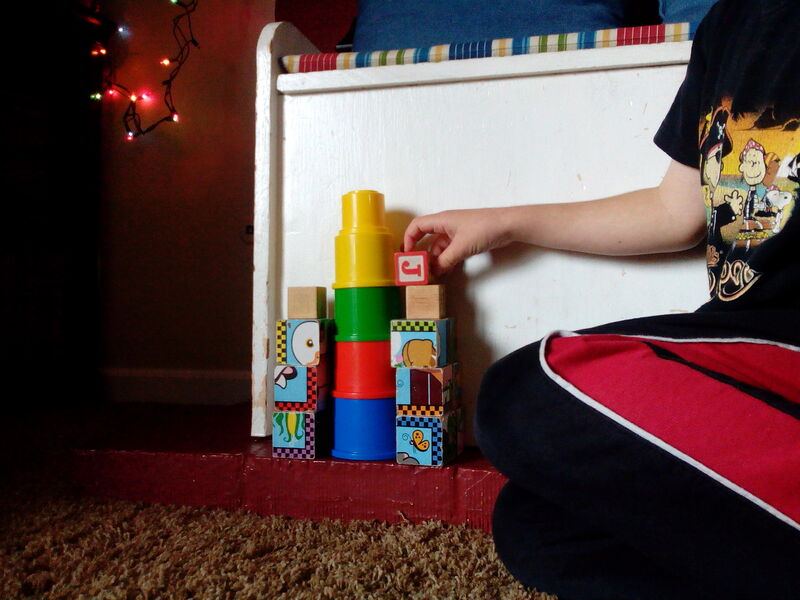 Adjusting to life with two kids rocked my world. During Pinky-Pie’s (that’s our four year old daughter) first year, I was having almost daily emotional meltdowns. Chocolate kept me going throughout the day (but that’s another post). I felt overwhelmed, and Christmastime was the worst. 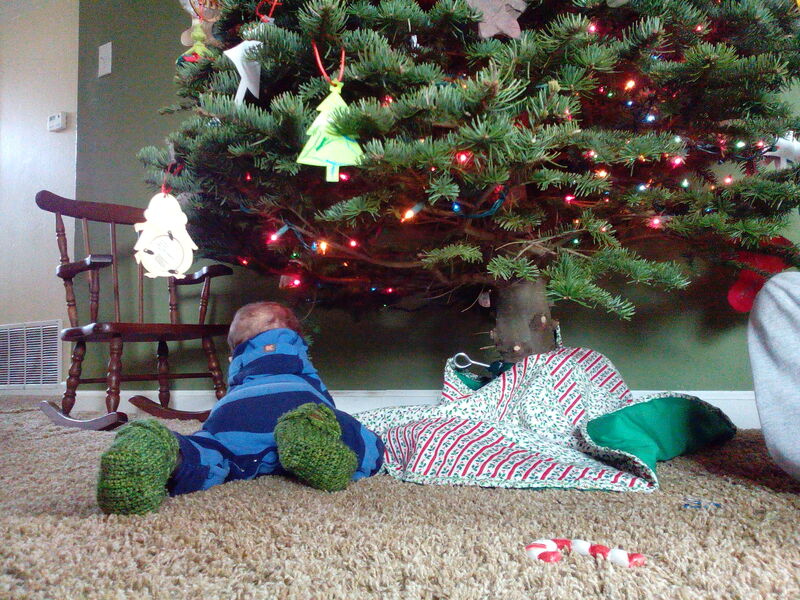 I am a recovering perfectionist and over-acheiver, so Christmastime as a mom hit me hard. I took onto my shoulders all the expectation that all the details be perfect, the food be special, the presents be plentiful, the decorations be magazine-quality, the memories be shiny and pleasant, and the kids look neat and tidy in their festive apparel. I felt pulled in so many different directions that one Christmas night, I quickly unraveled. Our oldest had a meltdown over brushing his teeth (and who can blame him after the day he had had being pumped full of sugar and stimulation? ), and I had my own meltdown in reaction. After that night, I knew that something had to change. 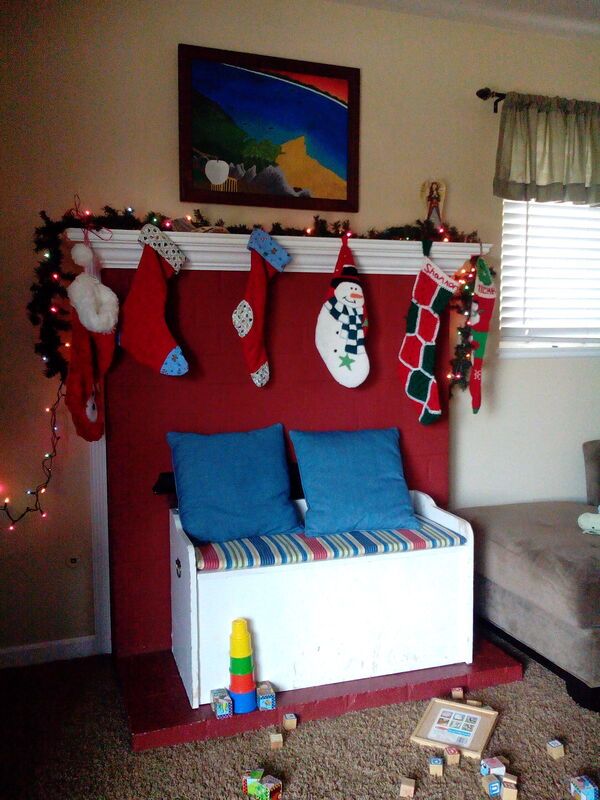 Over the last few years, we have made baby steps toward simplifying Christmas. But before I get into that, let me give you an idea of the expectations that I have put on myself in years past. When the firstborn was 4 and our daughter was 1, we had already purchased them several presents each. Nevertheless, on one of our precious date nights together, we ended up back at Toys’R’Us, purchasing more because I felt that they should each have ten presents a piece. I am not quite sure where I came up with that arbitrary number, but it was quite important to me. In the end, we didn’t even give them all the presents we had purchased. Some of them weren’t age appropriate, but the cool-factor and low price had won us over and led us to make an impulse buy. After we decided that things would look different, we adopted a friend’s maxim: something they want, something they need, something to wear and something to read. The kids got 4 presents that Christmas. And the universe didn’t come apart at the seams. We also got rid of half of the decorations. The first year, when we finished putting them out, the kids said, “Is that it?” So, the next year, I spread the decorations out over the whole month, putting one out each night and then having the kids hunt for it in the morning (which should tell you that we had at least 25 items after purging…let’s not even talk about before). They loved that. This year, in light of the big move, we’re cutting back even further. We spent some time at the beginning of the month, asking ourselves what we want to say yes to. What do we want to focus on this season? Here are some answers that we came up with: celebration of the dawn of hope, humility, restoration of relationships, service, music, provision, and the nativity story. You might be wondering how this plays out practically for a family of 5 with young kids. First, we decided that one present under the tree along with a stocking full of goodies would help to shift the focus of the day from the presents to actually spending time together with family. This also gave us the freedom to get high quality presents and not worry so much about the price tag, which had the added bonus of keeping us at home on Black Friday. memory attached. This did not leave enough to do the one decoration a day, so we replaced that daily activity with two other activities that focus on counting down to the main event, Christmas Eve and Christmas Day. 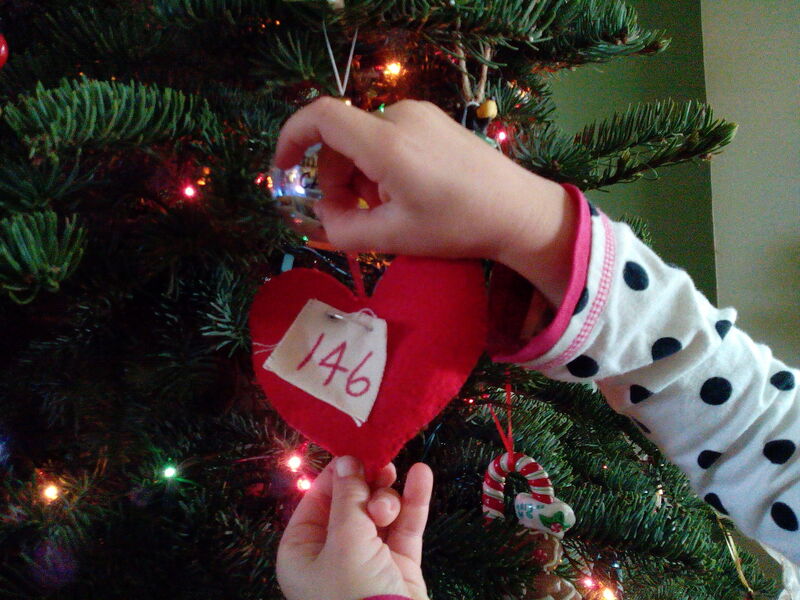 The first is reading a daily advent calendar that has been written with children in mind, and the second is putting magnetic numbered ornaments on a large Christmas tree magnet. The magnet does not excite me as much since it involves me remembering who put the ornament on yesterday and refereeing disagreements on the subject, but the advent reading after dinner has been a very peaceful addition to the end of our day. The kids draw pictures as I read and we will hang these on our tree to remind us of the whole story. As Mike mentioned in another post, we also happen to be abstaining from sugar this season. We have had to get creative with making memories that don’t revolve around sugary food. One day, for science, we froze the Christmas cookie cutters in water and had cookie-shaped ice for our snack. It sounds pretty pathetic, but the kids were pretty stoked about it. It’s amazing what they get excited about when they aren’t inundated constantly with “special treats.” Class day this week was especially difficult. We had “Crazy Christmas” dress-up and dessert day. 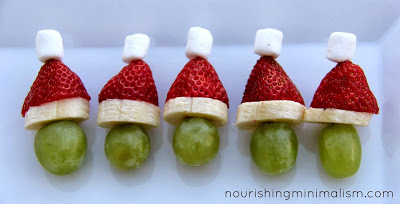 We brought Grinch-Kabobs. The kids were troopers, saying “no” to the plethora of sugar even when I wasn’t there. They got really into making the Kabobs and were really looking forward to having something tasty to eat, however, when I laid them on the table, I neglected to bring them back some. When I went back 3 minutes later, they were all gone. Pinkie-Pie (my 4-year old) took it in stride and ate ants on a log instead, log and all. The First Born had a more difficult time and may have shed some tears. However, when we got home, they got to make their own batch of Grinch-Kabobs and play Minecraft; and peace was restored. This means that the countdown to Christmas has taken on an epic aura since it will involve celebrating by feasting on sugary goodness with friends and family. I have been spinning this to fit the Christmas story by teaching the kids about the concept of the wedding guests feasting in the presence of the bridegroom (Mark 2: 19-20). We also chose a few holiday traditions to put on the calendar for this month. The kids packed shoe boxes for Operation Christmas Child at church. The kids helped me design and mail a Christmas card. We went to Grammy’s house to decorate her tree and then went to look at lights together. This weekend we will host a party with our friends from the Coast Love146 Taskforce. Our kids are the only little people who attend, but they don’t seem to mind. The highlight of the gathering is the cutthroat games that our friends Rob and Kelly oversee. This year will be our last candlelit Christmas Eve service at church for a while, so we made a point of staying in town to attend. To keep the mood fun in the midst of the purging, abstaining and saying no, we have also made a point to celebrate with the kids through song, jokes, and other entertainment. As part of our schooltime, we are learning “O’Come Emmanuel” as well as some Christmas themed jokes. I have also sat and watched a couple Christmas movies with them. Some are more beneficial than others, but my focus is more about doing something together. Rather than folding laundry, washing dishes or preparing food while they watched, I have tried to discipline myself to sit with them and cuddle. I found Curious George’s A Very Monkey Christmas, Mickey’s the Gift of the Magi, Veggie Tales’ The Star of Christmas, and, of course, Charlie Brown Christmas to have the added benefit of having a positive message to glean from all the glitter and glitz. So, although the trimmings and trappings look a little bit different, the change has helped us to experience the goodness of Christmas in a more life-giving way.